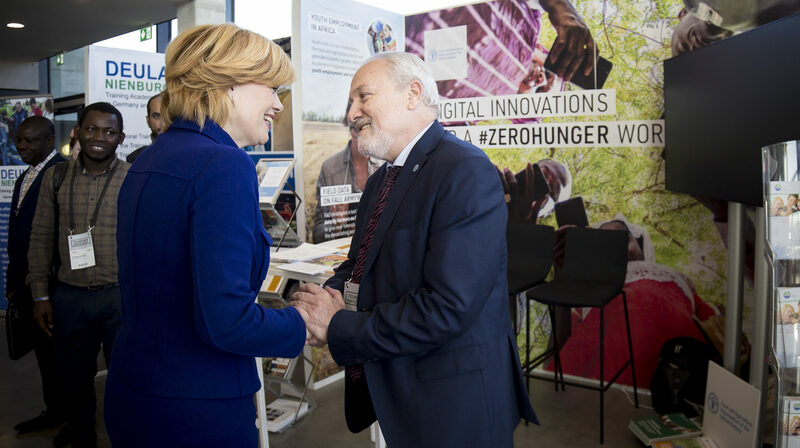 The Future Forum was a new GFFA format, combining a contemporary exhibition area and an open stage, it was meant to offer a lively space for an interactive exchange between established and new stakeholders within the GFFA 2019. The multimedia presentation of start-ups showcasing their innovative and practice-oriented ideas of the agri-food sector plays a central role in this context. At the same time, international GFFA visitors were provided with new ideas and information on concrete projects or digital solutions concepts for various challenging areas of agricultural practice at home and abroad by engaging in talks with diverse players and sharing their brief presentations on an open stage. Eiwa’s Digital Phenotyping Platform provides the service to completely digitalize phenological note taking in research, development and marketing plots of agricultural plants. The Platform enables Crop Science Companies to significantly increase the rate of research progress, reduce the time to market and accelerate market penetration, all while reducing manual work on the field. GAIPA / EAT GLOBAL E.V. – are living in peripheral and/or underserviced areas and are thus disadvantaged in their development opportunities. Projects supported will particularly focus on the needs, interests and resources of the people affected. The projects will contribute to sustainable development, following the triple bottom line principle of social, ecological and financial sustainability. Technology will play a major role in achieving the goals. This is referenced to in the EAT, which stands for Ecological Agriculture Technology. The gaipa project is one of the first projects of EAT global e.V. The development of the prototype was supported through the German Federal Ministry of Education and Research and the Prototype Fund. The software was developed under an open-source license. The objective is to implement gaipa following a non-profit business model. gaipa is a global farmer empowerment community equipping farmers to create self-determined and sustainable livelihoods. It will be a one-stop online community assisting especially small-scale farmers in developing countries. The community will be tailored to the needs and digital experiences of farmers. Varying user interfaces will be created, catering for the various levels of experience. This will reduce barriers in using this online service. At the same time experienced users, especially from supporting institutions such as government extension officers, NGOs or corporates will be supported in offering their services. The gaipa prototype was developed based on interviews conducted in India and Zambia in March and April 2018. The key element is the farming cycle, which shows farmers‘ activities as a continuous one. Our test showed this is an appealing and logical entry point for farmers. This is followed by a step-by-step guide for them to find a solution or information they are looking for. Farmers in developing countries are accustomed to such an approach from USSD services, such as recharging their phone or using information services on feature phones (pre smart phone generation). The Food Assembly’s vision is to create a better way to eat, where everyone has access to the pleasure of local food, and is connected to the people who make it. Community is at the heart of The Food Assembly – they connect neighbours to farmers, neighbours to each other, and everyone to their food. Bringing power back to producers and consumers, the social startup’s vision is a world with short supply chains where people re-connect to their food in a better way. By combining technology and sustainable agriculture, The Food Assembly supports a healthier world where everyone can shop, cook and eat with peace of mind. Starting in France, and now a movement across 7 European countries, The Food Assembly believes in value-led innovation and is constantly seeking to sharpen their digital tool that already connects more than 1.7 million consumers to 11,000 local food producers. The Food Assembly connects you directly to local food producers through a fair and transparent retail model. Along with The Food Assembly, two kinds of people make an Assembly happen: Hosts and Producers. The Producers sell directly to customers through The Food Assembly online market. Hosts organise the weekly online shop and the local pick-up markets. Members pay the food Producer directly, allowing them to earn more than 80% for their hard work. The Food Assembly offers a fair and transparent way of buying food: Producers set their own price, and the service fees are fixed and well-balanced for the Host and The Food Assembly. trecker.com 2012 was founded by Benedikt Voigt and Miro Wilms on the campus of the Humboldt University in Berlin. Voigt was previously an international SAP consultant with passion for programming and hence responsible for the technical implementation. Wilms has gained extensive experience in several internet start-ups – amongst others in one of Berlin’s biggest exits in 2016 – and thus brings profound business acumen. Today, trecker.com boosts digitization to an economic sector heretofore unrecognized by most companies. MonitorFish is a Berlin-based venture developing a smart diagnostic system for intelligent monitoring of animal welfare in aquaculture.